My question today is, do White Evangelicals really believe Donald Trump cares about them or their beliefs? What in Trump's history indicates he's religious? Trick question. Nothing. The world has watched his hedonistic antics since the late 70's and there's no evidence of God being in his life. I've watched Evangelical leaders like Jerry Falwell Jr., Paula White, and James Dobson disregard Trump's historical lack of interest in religious issues, his anti-women and racist rants, the Muslim ban, his anti-immigrant bashing and his constant lying. What's going on? Any one of these leaders can rattle off the 10 Commandments but none of them seem to think they apply to Trump. Why else would they support him? Well...there is that matter of Hillary Clinton (a Methodist all of her life) who is a Democrat. The White Evangelical brand is very strict about not voting for Democrats. I suppose they think it's a bigger sin than electing the anti-Christ Donald Trump. 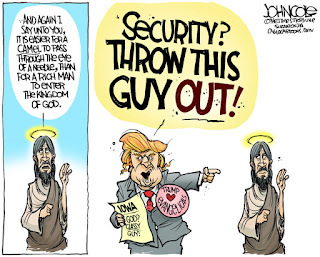 In order to vote for Trump evangelicals have to ignore most of the tenants of their religion. Televangelist Frank Amedia, who recently served in a volunteer capacity as a Trump "liaison" between the campaign and evangelicals, told his listeners to prepare for The Second Coming. "If we could see into the havenlies right now," Amedia said in a recent interview, "We would see a skirmish going on that I believe is the beginnings of the preparation of the way of the coming of the Lord." He may be right if Trump, aka the anti-Christ, is elected president. 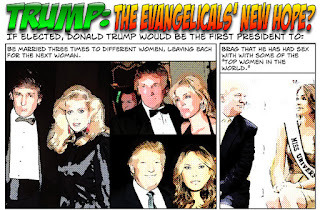 Which leaves me wondering why evangelicals would even think about voting for Trump if they believed that? 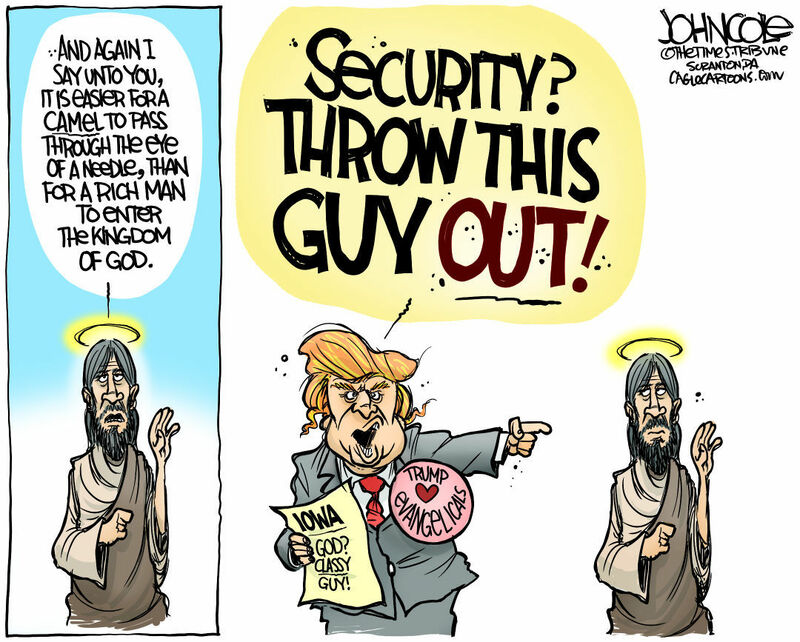 It appears Trump can walk down a street, shoot someone (his own words) and make promises to evangelicals he'll never keep...and some people will still vote for him.